Seacoast United teams are designated for league play within the New England Premiership (Premier & Select levels), New England National Premier League (NPL teams), or the US Soccer Development Academy (DA teams only). Team placement within each league is based on competition level in an effort to promote player development. 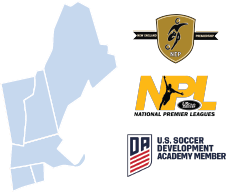 Travel requirements for the NEP and NPL are within the New England region, both home and away games. For the Development Academy, travel requirements include not only New England, but also New York, New Jersey, and Pennsylvania due to the club locations and structure of the program.